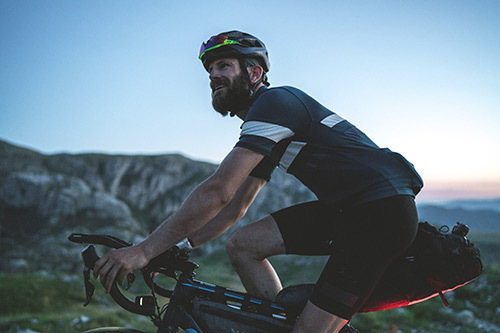 George Wigmore speaks to a Cass academic and an Engineering alumnus about their remarkable achievements in two of the world’s most gruelling, long-distance endurance races. For Dr Nick Motson, a Senior Lecturer in Finance at Cass Business School, this was how he spent six days in April 2016 as he ran the equivalent of six consecutive marathons through the Sahara, self-supported, as he attempted the world-renowned Marathon Des Sables. The summer of 2016 was also spent in a similar way by Dr Neil Phillips (who recently obtained his PhD in Geotechnical and Geoenvironmental Engineering from City) as he finished second in the gruelling Transcontinental Race, riding 4,000 kilometres (2,485 miles) through 12 countries from Belgium to Turkey in just under ten days completely self-supported to finish second. Having won the bet, Nick’s boss then bet him that he couldn’t run the London marathon the following year in less than four-and-a-half hours. Nick won the bet again. In the summer of 2015 a friend told me he had a slot for the Marathon des Sables in April 2016, which planted a seed. I’d just lost a close friend after a short battle with pancreatic cancer so decided to enter and take part in the race in his memory while trying to raise money for Pancreatic Cancer UK. With the race signed up for, the main issue soon became about time and fitting in training around busy work and home life. “I have three kids and a one-and-a-half-hour commute from home to the office so my biggest pressure is time,” says Nick. “From November until March I was running in the region of 50-65 miles per week, which meant finding 7.5 to 10 hours each week to train while minimising the impact on my family and work.” To help find time, Nick started combining his training with his commute, getting off the train earlier and running into Cass. I have been cycling my whole life, racing mountain bikes as a teenager, before a hiatus during my undergraduate studies. Moving to London rekindled my love for cycling as it was the easiest and most enjoyable way I found of getting around the city. Miles increased and I started road racing but had a desire to do some really big rides and push myself. I came across the first Transcontinental race and it sparked something in my mind to give it a go. Starting on the cobbled streets of Belgium at night, the race began with a huge effort for Neil as he covered 634km (394 miles) in a day from Belgium to the centre of France to reach the first checkpoint, before setting off for the next one in Switzerland and the Alps. Then day four happened. Running the longest stage of the race, Nick had 52 miles to run within a 34-hour time limit. With a steep climb forming a choke point, Nick and the other runners were forced to wait in the blazing midday sun. The result, was that Nick got overheated, developed heatstroke and started vomiting, requiring a 3.5 litre IV drip that night to aid rehydration. But despite the setbacks, he still managed to keep going. To help survive the long days, dehydration and risk of losing salt and vital electrolytes, Nick also developed some interesting food habits during the race. A distinct low was entering Macedonia from Kosovo. I was hit by a generational storm that cut my day short and was one of the scariest moments to be on a bike while trying to find refuge. Twenty-one people lost their lives in Skopje that night due to flash floods and waking to the sight of cars washed in to ditches opened my eyes to what could happen. Astonishingly, Neil finished the race in 9 days, 17 hours and 42 minutes. Despite the dehydration and challenges of running through the Sahara, Nick also completed the race and ended up 716th overall. So would they do it all again? While Neil aims to focus on domestic racing this year, Nick has other plans. After all, while the pain is fleeting, the memories, adventures and intense sense of satisfaction will last forever. A keen cyclist himself, George Wigmore is a Senior Communications Officer at City, University of London. He has also written for The Guardian, The Observer and the BBC.